But there’s nothing healthy about fries you say, my nutrition-aware reader! Or, there is as long as they’re sprinkled with fresh parsley and lemon juice like those from that Greek restaurant (yes, Maureen, I’m talking about you!). 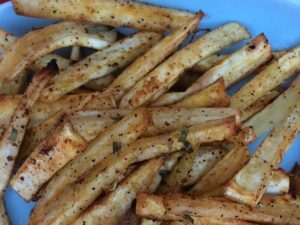 Well, try those parsnip fries. And if it’s your husband doing the groceries, you need to write: parsnips, 6 (white-ish vegetable in the shape of a big carrot). Roast for an extra 5 to 10 min – just keep an eye on them after 5 min: this ensures crispiness but a minute too long and crispy turns into a disappointing burnt!